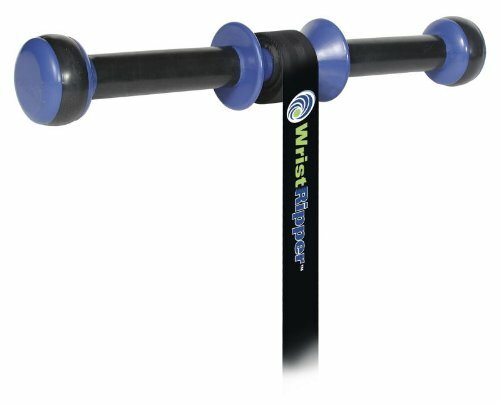 The WristRipper® is a wrist roller exercise device that puts a new twist on one of the oldest and most effective ways to strengthen your hands, wrists and forearms - the wrist roller. In just minutes a day, you can improve your wrist and forearm strength. The forearm muscles are the key to wrist and grip strength which is why this product is used by golfers, baseball players, hockey players, tennis players, body builders and rock climbers. This product will help improve performance for any activity that requires grip strength and the use of your hands and wrists. Simply roll the weight up and down as many times as you can to exercise and strengthen your hands, wrists and forearms. Depending on how strong you are, it is recommend to start with 2.5lbs or 5lbs and add additional weight as you get stronger. This product allows for multiple gripping options. You can grip the handle or outer knobs to work different ranges of motion to get a complete forearm workout. Weight plates are not included with the product and can be purchased at Amazon.com, local sporting good stores or other online retailers. The weight-loading pin is compatible with 1" standard; and 2" olympic weight plates. Maximum recommended weight is 10lbs. The Wrist Ripper® is a wrist roller exercise product that puts a new twist on one of the oldest and most effective ways to strengthen the hands, wrists and forearms. The WristRipper® has many added improvements over homemade and other wrist roller products on the market. #1 Strong injection molded handle provides multiple gripping options to work different ranges of motion for a complete forearm workout. #2 Rubber gripping areas help reduce slipping. #3 Heavy duty adjustable webbing strap and center guides keeps strap in the middle for proper balance. #4 Weight loading pin makes it easy to load/unload weights and is compatible with 1" and 2" weight plates. WEIGHT PLATES ARE NOT INCLUDED WITH THIS PRODUCT AND ARE SOLD SEPARATELY. Maximum recommended weight is 10lbs. The Wrist Ripper® is MADE IN THE USA! If you have any questions about this product by WristRipper, contact us by completing and submitting the form below. If you are looking for a specif part number, please include it with your message.